Dear HO Modelers: A couple of months ago we were sent some information from Walthers re a possible release of a working container crane. We informed Walthers we thought the idea of a working container crane for a container terminal would be an excellent addition for a number of our customers layouts. So just to keep you up to date, here is the information re the upcoming release of the working container cane. Enjoy. 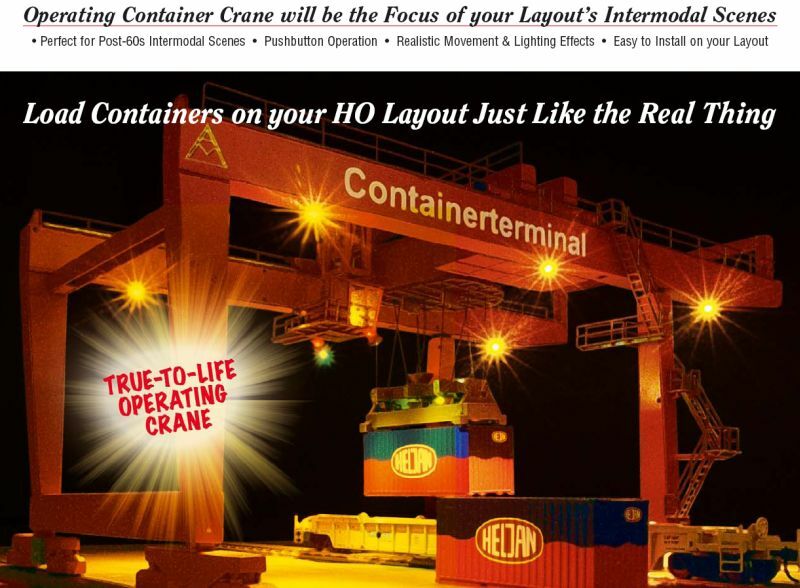 See Heljan's New HO Scale Intermodal Crane In Action! Combining a full range of prototype movement, smooth operation, easy assembly, DCC-compatibility and modular design, this incredible working HO Scale model opens new areas for realistic modeling and operations. For the first time, you can actually load and unload intermodal trains like the prototype. As trains arrive, the crane lights can be turned on, the unit moved alongside each car, the lifting trolley extended, turned and lowered, and containers moved to and from road, rail or ship - all with the touch of a few buttons. Powered by small, rugged motors mounted right inside the model and a precision drive system like those found in today's finest model locomotives, the crane responds to the controls as smoothly and realistically as the prototypes. Using built-in DCC technology, a simple push-button controller allows complete control of all crane operations on DC or DCC layouts. The controller is also fully assembled and easy to use, or you can run the crane with a joystick or home computer (both sold separately) if desired. Separate decoders for the crane and the trolley include adjustable Configuration Variables (CVs) to provide 9 speed steps for faster or slower operation of all functions. And, one controller can run up to three cranes, each with its own programmable address! A built-in electromagnet in the trolley securely holds containers during lifting; two 20' containers equipped with metal plates are included, and additional metal plates are offered separately to convert any container for use with the crane. The crane has sufficient clearance for up to three stacked containers below. In the real world, intermodal operations never stop. And thanks to a full array of working lights, you can re-create the drama of nighttime operations at your own crane with the touch of a button. A working spotlight is mounted on the operator's cab, while a full set of gantry lights can floodlight the area directly below the crane. Both are independently controlled so that one or both can be used as desired. The model actually uses prototypically sized and super-bright LEDs for thousands of hours of trouble-free operation with no bulbs to burn out or replace. The modular base plate provides a firm foundation for operations and is easy to install on new or existing layouts. This modular assembly allows for almost unlimited expansion using additional parts available separately. The set comes with four end pieces and four central sections, which are prepainted and weathered. When assembled, the standard base measures 13-3/16 x 22-13/16" (33 x 57cm). Molded cut lines allow up to five tracks, four under the crane and one along side, to be installed quickly. Two sections of railroad track are also included. All that's needed to get started is an AC or DC power pack with an output voltage of 14-16V, 2.5 A. An illustrated instruction manual provides complete and easy-to-follow instructions for assembly, operation and programming. 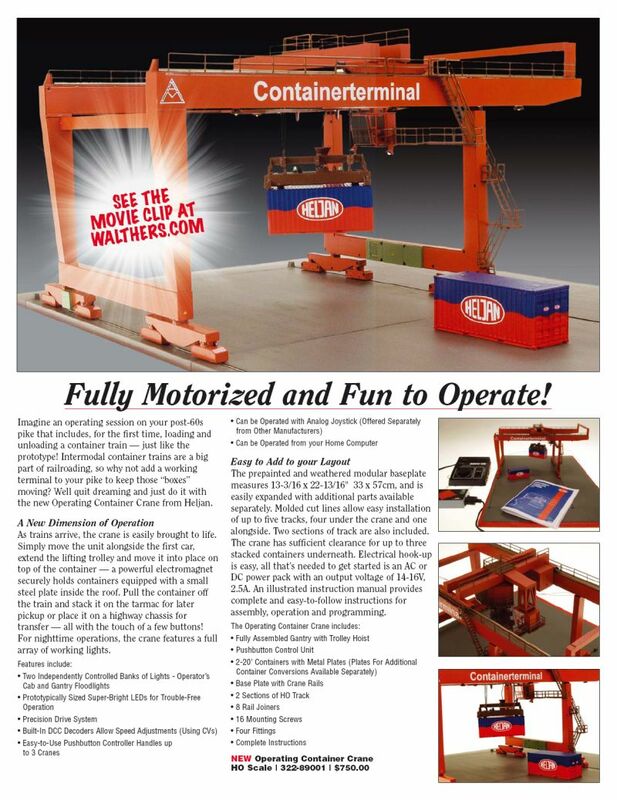 This amazing model comes complete with a preassembled gantry with trolley hoist, a control unit, two 20' containers, a base plate with crane rails, two sections of HO track, plus eight rail joiners, 16 mounting screws and four fittings.